Balans Soho Society: A look at their refreshed restaurants and menuVisit British Summer Time Hyde Park’s open house all this weekCan McDonalds ‘Signature Collection’ really compete in a crowded market? Take your pizza obsession to a new level and visit pizza heaven. 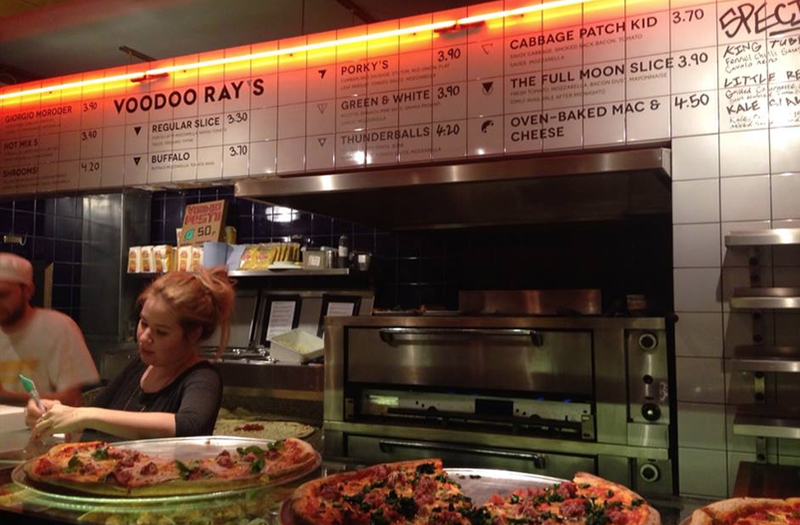 Voodoo Rays is a relatively new laid-back pizza joint which opened just over a year ago in Dalston, and now in Boxpark. The chain prides itself on offering fast service, and interesting flavour combinations. In true New York style the pizzas come in slices, with 14 flavours to choose from and are thin and crispy with a whole load of toppings. Just grab one, or as many slices as you wish. A pair of Voodoo slices is the equivalent of an entire 11″ pizza, so… it’s easy to fill up fast! Voodoo’s mixes quality ingredients and innovative flavour combos. The pizzas are made using Italy’s renowned Caputo flour; San Marzano tomatoes are imported specially for the all-important Napoli sauce. The interior is as funky and fun as the brand itself, with hand drawn pizza slices on the walls, and contracting blue and yellow artwork. The pizzas come in at £4.20 and under for a slice or you can purchase the whole thing but be warned they are a 22 inches…. Yup! Big. 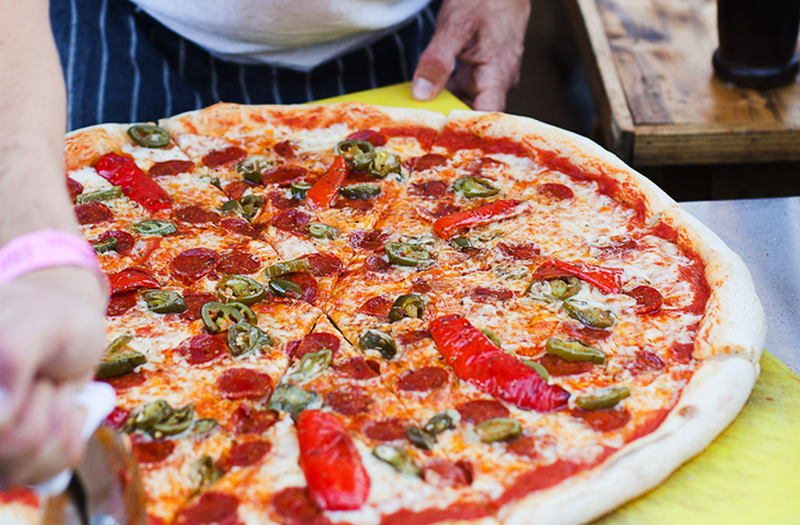 Voodoo Rays is open until 4am and they serve plenty of beer, cocktails and frozen margaritas too making it the ultimate pizza experience. Reviews for the joint love how you can come here for dinner before going out, and back again at 2am after. It’s the perfect drunk food, but also perfect for catching up with friends. They’ve also recently joined Deliveroo, so you can enjoy the Voodoo experience in your own home. Sit in or takeaway, with slices around £4 each and open till 3am on Friday and Saturday you can’t go wrong.